Ooh, what wonderful finds aren't they? For this little lot I cast my net in my most favourite of all hunting grounds, Totnes. Mmm Totnes, I would marry Totnes. It may be so 'New Age' and 'alternative' but it showcases some of the best independent shops (and a flea market) in England. Ok, if I'm pushed for a decision, it's a joint tie with Ludlow. There. I've had some wonderful finds recently which I keep forgetting to post. I think I'll do a 'Look what I've thrifted' week, this week. I am feeling much happier and balanced now. It was a shock to the system going back to school, but I'm now falling in love with my new class. I just love the sweet and funny things that they come out with. One being (sorry Catherine to hear this yet again!) when I was lining up the children to take a small group to visit our Head Teacher in his office; one little boy squealed with delight and said to the child next to him, "This is the happiest day of my life!" Perhaps you had to be there, but it was so unexpected and it certainly brought a smile to the face of all I told...including the Head Teacher! 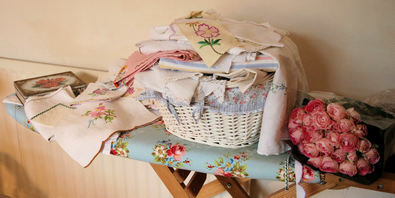 I've been busy of late, sewing my presents and have been making extra to sell. 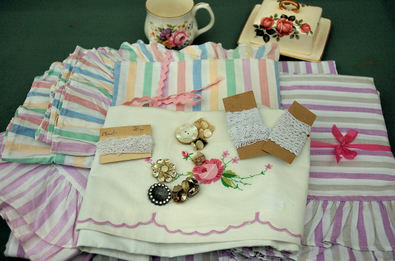 I have a wonderful friend, Amanda, who has a stall, Shabby Chick, at Totnes market. This is where I buy my candy striped pillowcases and other wonderful treasures. She has kindly said that she will sell my goodies so it's been all systems go. This has meant every surface covered with thrifted linen and the odd bunch of roses for Max's mummy. Oh to have a room of my own..